For most parents, the thought of spending long periods of time in a car with their toddler is an absolute nightmare. While there’s no denying it can be a very daunting and stressful experience, with a little preparation it’s totally possible to survive and maintain your sanity. 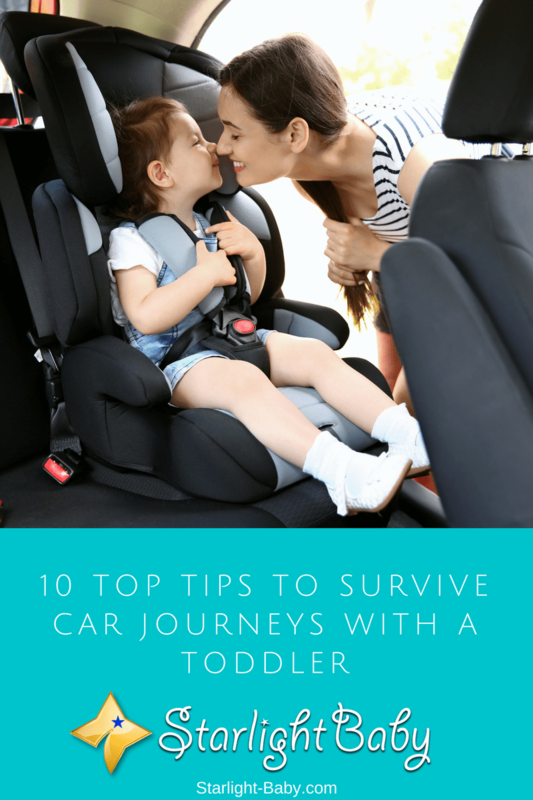 Here, you’ll discover some top tips to survive car journeys with a toddler. If you’re travelling in the morning, it’s really important to ensure you get a good night’s sleep the night before. Now, I know it’s probably hard to remember what a good night’s sleep actually is since you became a parent! However, making sure you get as much sleep as possible will help to make the journey much less stressful. Sleep deprivation can contribute to stress, and of course it’s not exactly safe to drive when you’re tired! So, if you can get a good night’s sleep, it will reduce the number of breaks you need to take along the way and help to keep you feeling that little bit calmer. When you’re going on a long journey, packing a ridiculous amount of stuff is sadly unavoidable. Even heading out to the grocery store can feel like you’re off on a military mission with the amount of stuff you need to take with you. However, while you are going to have a lot of stuff with you, you’ll want to avoid putting stuff into the backseat area of the car. You can get away with putting your toddler’s backpack in the backseat area, but anything else will just clutter up the space. Trying to find things while you’re driving to calm a grumpy or hyper toddler can be extremely stressful. So, keep the backseat clutter-free and you’ll be surprised how much of a difference it will make to the journey. Out of all of the tips featured on the list, this one is definitely one of the most important. It’s a good idea to plan out the entire route. Figure out where and when you can have breaks and always have a back-up route planned. Anything can happen on the road. You could be held up by an accident for example. Without a backup plan, you’d have to go through the stress of figuring out where to go next, as well as your toddler demanding to know where you’re going, why you’re turning around and additional moaning about when you’re going to get there. Nope, it’s much easier all around to know exactly where you’re going and what to do if something unexpected happens along the way. Breaks are essential when you’re going on a long journey but try not to have too many. No only do they lengthen the car journey, but they can also be pretty stressful. Your toddler may decide they don’t want to get back into the car as they’re bored of it now. So, there’s the potential for a full-blown tantrum. Try to get to wherever you need to go as quickly, but also as safely as possible. Plan for lavatory stops and remember to take breaks in accordance with road safety guidelines. This may sound like a pretty bad idea, after all, who wants to travel at night when you could be relaxing? Well, travelling at night is actually much less stressful than travelling during the day. For one thing, your toddler will likely sleep for most of the way. There’s also much less traffic on the roads at night so you won’t need to worry about delays. You also won’t need to worry about meals either. So, you’ll get to wherever you need to be much quicker driving at night than you would during the day. Regardless of what time you plan on driving, it’s important to make sure you take plenty of snacks. These will prove invaluable for both you and your toddler. Try to make sure they’re healthy snacks as otherwise you’ll end up with a hyperactive toddler and you’ll both end up feeling grumpy when the sugar rush wears off! Food can also be a great boredom buster for kids. Now obviously, that doesn’t mean you should just keep feeding them. However, on a long road trip snacks aren’t just useful, they’re essential to keep energy levels up and to help you keep hold of your sanity! One of the key things that’s going to make your journey so much easier is making it fun for your toddler. Before you leave, have a list of games and activities that will keep your little one entertained. Car games such as “I-Spy”, or the name game, can really help to pass a lot of time and make it a little more fun for everyone. As well as in-car games, you can also take your toddler’s favorite toys and even a tablet or kid-friendly smartphone. Digital entertainment is awesome and can really keep your little one quiet for hours. Obviously too much screen time is bad for toddlers, but just as a small distraction on a long car journey it’s perfectly fine to give in and let them watch a movie or cartoons. One mistake you’ll undoubtedly regret is playing all of your planned games early in the journey. The trouble is, if you’ve got a particularly long journey, you’re going to get really stressed out if your toddler gets bored of all of their games early on. So, spread them out a little. Play a game shortly after setting off, then simply chat to your toddler for a while. Let them take in the scenery going by. This also teaches them that being bored for a while isn’t such a bad thing. If you’re continuously providing some form of entertainment, your child will grow up to constantly need entertainment. You’ll notice they’ll start to make up their own entertainment, which is great for their little imaginations. If you’re travelling with a partner, it really helps to split up your driving responsibilities. This can actually limit the amount of breaks you need to take too. You’ll also find it really useful for one adult to keep your toddler occupied while the other focuses on driving. We’ve talked about having a back-up plan in your route just in case something happens, but it’s a good idea to have a backup plan for everything. Has your toddler got a toy or something you usually don’t like them to play with? If so, you could bring that out just in case nothing else works to settle them down. Could You Survive A Yes Day With Your Toddler? We live on a farm. When the delivery date approached, we traveled to the city, around 400 kilometers from our home. Our baby was born in a city hospital and after one month we drove to our farmhouse. It was difficult to drive with the baby because he had to be carried on the lap throughout 10 hours drive along the treacherous mountain road. Our anniversary date is approaching and we are making plans to travel. The baby will be 10 months old. The tips mentioned here are very useful. I agree with you that the tips given on this blog are really good and one that one can get to use in ensuring we have stress free child raising session. Big congratulations as you’re celebrating your wedding anniversary and that’s good for you and your wife. I hope that your family continues to grow in love and care. Wow! That is a long drive to the city. We hope you’ll have a safe trip every time. I’m sure you will find a tip or two from here that you can use along the way. Best of luck and congratulations on your anniversary! We travel frequently with my son. Around three to four hours drive and sometime longer from our city to the central city where traffic will welcome you with more than open arms. I am proud to say that we’ve mastered the travel with babies and toddlers. The tips here are tried and tested by our family and proven very effective. There’s this one additional thing we do when my son became a toddler. During long travels, especially at night, I bring with us one of his pillows. This made him more comfortable sleeping in the car while travelling and helps him fall asleep faster. Maybe because he has something that belongs to his bed and made him feel like home. Whatever the reason is, this method proves useful for our travels too. Thank you very much for sharing your travel tip, AmieBotella. Glad to know you’ve tried and tested these tips. We truly appreciate your sharing 🙂 Be safe always. Planning is essential when parents are going on a travel with their toddler in the sense that a good planning can be a way to keep things on a good mood especially when there are setbacks that happens on the way. Also, getting enough sleep a day before the journey is crucial in order for the journey to be successful and stress free. The sleeping well a night before the trip is very essential for it would help the parents oozing with energy the next morning to handle perfectly all the tantrum the baby is going to throw up on the trip. I have come to understand that baby’s and kids are not always comfortable in tight spaces which being stuck in car for longer hours is, but with enough rest prior to road trip, the parents can withstand the pressure of the kids. You’re right, Henrywrites. Planning is very important when traveling with a child. When my kids were little, it often takes me half a day before the trip to prepare everything. And I double check everything before I go to bed the night before the trip. Every parent needs all the rest he/she can get before the trip so it will be smooth and less stressful. It’s so thoughtful of you to share this with your friend, Isaiah. I’m sure he will appreciate it. This will help ease his burden when traveling with his baby. I’m planning my first road trip with my 2 year old toddler and I find these tips to be very helpful. Hopefully with these tips will it make for a pleasant trip. My 2 year old does very well during short car rides but will see how she does on this trip. Driving at night seems to be a good idea because that time most kids would be fast asleep while you focus on your driving. But the downside of this is that night trips are dangerous especially when you have a little one in the car. Also I support the point of planning in advance well and come with lots of snacks, it’s what would help you survive their tantrum on the trip. Yes, traveling at night is not as safe as day trips. It’s important you don’t fall asleep while driving. It would be good to have someone replace you drive in case you feel sleepy. Going on long trips and emergencies are two of the reasons why I did my best to learn to drive. It ensures I can replace my husband when he feels sleepy during the long drives, and I can take my kids to the hospital in case my husband is not around. In most of our daily life, we have different ideas about the life aspects but according to the baby’s life, it seems really different and amazing. Almost everybody is baby friendly bacause anyone of us has crossed this manner. I personally believe that this article is very helpful and brings new ideas to the couples/people who are planning to have a child. Thank you for the lovely feedback. Yes, we love to help new parents or young couples go through raising a child in a less stressful manner by sharing tips like these. We hope you could share our blog with friends who need it. what i liked the most is travelling at night , it is really a good idea . you should take a lot of stops during your journey so your toddler wont get tiered from being trapped in his car seat. Yes, that is a very good suggestion, etkan. Thank you for sharing the tip of going on frequent stops. It cannot be avoided when one is traveling with kids. They get bored so easily and likes to pee from time to time, haha. Fantastic! These tips are really going come in handy when we have to make our long trips to visit our parents. My brother and his wife will also greatly benefit from this information, as they have always shared stories of their past struggles in this kind of situation. Their biggest struggles have been number 2 (Don’t over pack the car) and number 7 (Have lots of car games) as the car is always over packed and are usually no games planned, at all. This advice is spot on! The games and the snacks are always they key with my daughter, because as long as she’s doing something she will be the most well-behaved little princess in the world. That’s because the trick is to keep the toddlers amused enough not to get bored about being locked in a car for more time than what they’d like. I’ve also found out that if your kid is particularly cranky about that trip and you can afford it, you can always motivate them by telling them there’s a surprise waiting for them at the destination. Maybe it’s a toy they’ve wanted, or a bag of candy, or any other small affordable treat you can get! The excitement of finding out a gift and a surprise will most likely keep them pumped and energetic, but in a good way, and they’d be more likely to stay calm and listen to you.